2. Over 40 million people in America have some bone loss and are at risk for developing osteoporosis. 3. Osteoporosis has no symptoms in the early stages. This is why it is called the silent disease. 4. Osteoporosis screening is recommended for people who have symptoms such as a fractured bone, hunched posture, sudden back pain, balance problems and risk factors. Otherwise, screening is recommended beginning at age 65. 5. Osteoporosis risk factors include gender (female), ethnicity (Caucasian or Asian), smoking, family history, poor nutrition, lack of exercise, age (post menopausal), some diseases and medication. 6. Osteoporosis exercises can strengthen bones. Good exercises for osteoporosis include walking, running, dancing, stair climbing, resistance and strength training. 7. Bisphonate therapy can slow the progress, stop, and even reverse osteoporosis. Oral bisphonates can be taken once a week or once a month. The latest development is an intravenous therapy that is administered only once a year. 8. Medications that can cause osteoporosis include glucocorticosteroids, blood thinners, immunosuppressive drugs, anti-convulsives, and thyroxine. 9. Medical conditions that can lead to osteoporosis include anorexia, autoimmune diseases, hyperthyroidism, vitamin D deficiency, malignancy, chronic liver or kidney disease, and Cushing’s disease. 10. Osteoporosis costs America over 15 billion dollars a year. The cost will increase as more people are living longer and as the boomers continue to make the transition to senior citizens. Knowing your osteoporosis facts can help you prevent this debilitating condition. 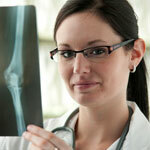 If you do develop this disease, osteoporosis facts will help you be a better partner with your doctor in treating it. Knowing your osteoporosis facts can also help you prevent this disease in those you love.